Retail Auto Sales to Drop Further as Alternatives to Ownership Become More Accessible and Affordable, According to Final Phase of Cox Automotive Evolution of Mobility Study - Cox Automotive Inc. Increased education and exposure to alternative ownership models could lead to consumers relying significantly less on personally owned vehicles. Affordability of new mobility services could increase consumer consideration and result in fewer new-vehicle retail units sold. Gen Z and Millennials will likely be the first to adopt alternative ownership models. ATLANTA, January 17, 2019 – Retail auto sales in the U.S. could drop as much as 29 percent as alternatives to traditional vehicle ownership becomes more accessible and affordable, decreasing the amount of miles consumed by personally owned vehicles. This is the key finding in Phase No. 3 of the Cox Automotive Evolution of Mobility Study, released today. The latest study shows how the cost of automobile ownership continues to be a major issue for many Americans, with nearly half of consumers surveyed believing car ownership is too expensive. Consumers are open to exploring new transportation methods versus owning with more one- third (36 percent) of respondents interested in reducing the number of vehicles they own in the next five years. In the study, current cost of ownership was estimated to be 50 cents per mile driven. In a scenario where alternatives are made widely available and at a cost of 60 cents per mile, the relative similarity of costs between the two, coupled with other factors benefiting the alternatives, could lead to a reduction of new vehicle retail sales by as much as 29 percent. At the same time, fleet sales may likely increase, offsetting the drop. Greater accessibility and education to alternative transportation methods will contribute to a lower reliance on consumers personally owning the vehicles in their garage. In the first phase of the study, Cox Automotive found consumers’ attitudes about the necessity of vehicle ownership are gradually changing with 4-in-10 consumers saying access to transportation is necessary, but owning a vehicle is not. In fact, one-third of consumers surveyed in this latest phase say they are open to new transportation methods rather than owning their vehicle. Despite this, personally owned vehicles still dominate consumer transportation. In a typical month, 93 percent of miles traveled are in a vehicle that someone personally owns. Ownership alternatives only account for 3 percent of miles traveled today. When put through various scenarios where all transportation alternatives were available to them regardless of where they live, consumers will increase their usage of mobility alternatives and the share of miles traveled by personally owned vehicles drops significantly to 72 percent. With the share of miles traveled changing, so will the need for a portion of the population to personally own a vehicle. Increased perceptions of the high cost of vehicle ownership and the overall cost benefit of owning decreasing, making affordability the primary driver in the evolution of mobility. Once mobility services present comparable and lower cost transportation options, consumers will make transportation choices that fit within their personal budget. When provided with several transportation scenarios, the most significant driver for consumers’ transportation decisions was ownership or usage cost, which includes everything from monthly vehicle payment, maintenance, insurance, gas, and any other costs that contribute to the cost per mile. Cost was twice as influential as the type of transportation method – ride-hailing, owned/leased – and more than five times as important compared against the remaining drivers tested, including the amount of time to wait for a ride and amount of time committed to a transportation method (i.e. term of a loan/lease). Once all options become available and as alternative cost per mile bridges the gap with traditional personal ownership, a consumer will be more likely to shift their miles away from personally owned vehicles. At this point, Cox Automotive projects personally owned vehicles to account for 61 percent of miles traveled, contributing to a 29 percent decline in new-vehicle retail units sold. The tipping point, where an even share of miles traveled will be in personally owned vehicles and alternative mobility options, is when alternative ownership costs reach 35 cents per mile. However, this flip is likely not achievable today, as it is reliant heavily on the full adoption of autonomous vehicles. When examining the consumer groups that will drive this mobility change and who presents the greatest opportunity for manufacturers, dealerships and mobility providers, younger generations, Gen Z and Millennials, will be the first to adopt alternative ownership models. This is based on their openness to try new forms of cost-effective transportation, as 52 percent of Millennials say vehicle ownership has become too expensive, which is a 10-percentage point jump from those surveyed in 2015, and much higher than Gen X and Baby Boomers. Gen Z and Millennials are currently spending the most money on their transportation with an average cost per mile of $0.71 and $0.79, respectively. This is significantly higher than Generation X ($0.56) and Baby Boomers ($0.50). Cost per mile for ownership is generally higher for Gen Z and Millennials because of their likelihood to use various modes of transportation beyond their own vehicle as a result of the shorter distances they need to travel as many of them live in urban areas. With more questions around the affordability of personal vehicle ownership, younger generations are least likely to prefer traveling in a personally owned vehicle if all mobility alternatives were accessible to them. Share of miles traveled via a personally owned vehicle was 64 percent for Gen Z and 65 percent for Millennials, compared to 71 percent for Gen X and 82 percent for Boomers. When comparing ride-hailing, car-sharing and car subscription services, accessibility is a top barrier to adoption. In fact, accessibility of car subscriptions at 42 percent is more of a hurdle than the 39 percent of consumers who prefer riding in a vehicle that is completely their own. However, when all alternative ownership models are made fully accessible, car subscriptions see the most potential growth in share of miles traveled, from less than 1 percent today to 10 percent in the future. This compares to ride-hailing, which decreases to 1 percent and car-sharing, which grows from less than 1 percent to 1 percent. Still not the exponential growth as seen by subscription, but of note given the high awareness of ride-hailing today. As an expanded offering of models at new lower price points are introduced, car subscriptions could see significant growth in share of total miles traveled by consumers, jumping from less than 1 percent today to nearly 25 percent in the future. In fact, with the introduction of some new variants, the cost of car subscriptions have already started to decline since first being introduced to the market, while eventual price decreases for ride-hailing and car-sharing will largely be dependent on the integration of autonomous technology. 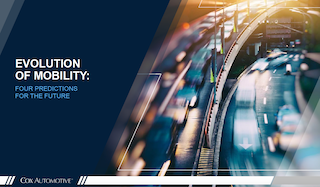 Cox Automotive kicked off its Evolution of Mobility Study in August 2018, with the first phase investigating consumer perceptions of Alternative Ownership and Autonomous Vehicles, to grasp the full picture on the mobility landscape today and how it has evolved over the last three years. This was followed by a second phase examining the Dealers Perspective and acceptance for ride-hailing, car-sharing, autonomous vehicles, and subscription compares to that of consumers, and what new mobility models dealers are open to trying, as well as what barriers exist for adoption today. The final phase of this research was meant to understand how these new alternative options will impact consumers’ transportation decision and ultimately personal vehicle ownership. Download a full version of the Cox Automotive Evolution of Mobility Study findings below.